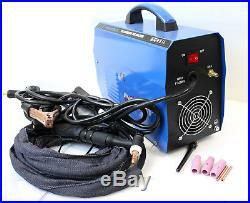 200 Amp TIG Torch Stick ARC DC Inverter Welder 110/230V Dual Voltage Welding. Welding Machine For Stainless steel, Alloy steel, Mild steel, Copper, Cast Iron and Chrome. 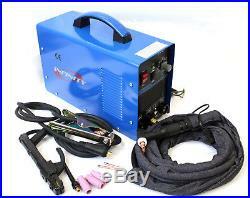 Powerful welder capable of welding up to 3/5 Stainless steel, Alloy steel, Mild steel, Copper, Cast Iron and Chrome. The full-size TIG & Stick platform, outperforming the competition on arc quality, voltage control, duty cycle and value. This is optimized to deliver a flawless weld, making spatter and post-weld cleanup almost non-existent. Dual Voltage Input (110V/230V) means you can plug into any common power supply. PLUG IS NOT INCLUDED. TIG torch & cable, Electrode holder & cable 300A , Work clamp & cable 300A. 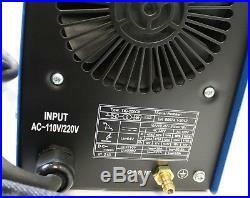 TIG-200CB is a rectifier adopting the most advanced inverter technology. Welding power source can offer stronger, more concentrated and more stable arc. When stick and work piece get short, its response will be quicker. It means that it is easier to design into welding machine with different dynamic characteristics, and it even can be adjusted for specialty to make arc softer or harder. The machine can be for multi-use, and can weld stainless steel, carbon steel, copper and other color metal, and also can use for traditional electric welding. Processes: TIG (GTAW), STICK, ARC, MMA. Input Current: 39A (110V) & 27A (220V). Rated Output: 25V & 28V. Product Weight: 25 lbs. Package Weight: 35 lbs. Professional TIG Torch Gun and Assembly. Electrode Holder and cable. 110V and 220V Cable without Plug. 2 pieces of Tungsten 5/64 in. Please make sure you order the correct item as orders cannot be altered after the order is paid for. The flat rates quoted in the table will apply to most destinations in the countries/states listed. Occasionally (usually, but not always in remote/rural areas), some addresses will not qualify for the service or rates that are quoted. We reserve the right to cancel an order or terminate a sale for any reason. All items are 100% brand-new, and not refurbished in any way, unless the listing specifically states otherwise. Boxes may be opened for the purpose of testing, inspecting, photographing, adding additional padding/packaging/instruction supplements, or ensuring the completeness of the item. Customers must return all items in their original condition which include the original Packaging accompanied with packing slip, Documentation & Manuals and Accessories, etc. We welcome and treasure all of our customers. Listing and template services provided by inkFrog Open. 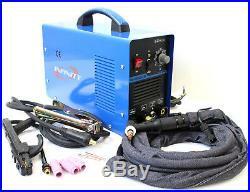 The item “200 Amp TIG Torch Stick ARC DC Inverter Welder 110/230V Dual Voltage Welding” is in sale since Monday, November 27, 2017. This item is in the category “Business & Industrial\CNC, Metalworking & Manufacturing\Welding & Soldering Equipment\Welding\Welders, Cutters & Torches\TIG Welders”. The seller is “xtgear” and is located in La Puente, California. This item can be shipped to United States, Canada.